Let’s say that your child (we’ll call her “Mary”) plays on a soccer team that uses TeamSnap. You already have a username and password so you can log in and check the schedule, set Mary’s availability, sign up to bring refreshments and so on. But what happens if someone else in your family also needs access — say your spouse? 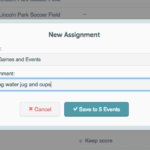 Now, instead of having to share your TeamSnap login information, you can add your spouse as an additional contact and send them an invitation to create their own login. With additional contacts, two or more people can log into TeamSnap and control a single player’s record. It gives parents the flexibility to manage their child’s record without needing to share private login information. We think TeamSnap now gives families the most comprehensive ways to share contact information (and optionally logins) for families, and we look forward to hearing what you think. Our help blog has specific instructions on setting up additional contacts for a player.